Arrive Lao Cai station in the early morning, pick up and transfer to sapa, having breakfast before starting the trip to Fansipang peak, You are having a couple of interesting days waiting ahead. Travel by car toward the Silver Waterfall where you will be able to take a short walk to the waterfall. You will then drive further to Heaven Gate, the highest peak of roads in Vietnam. 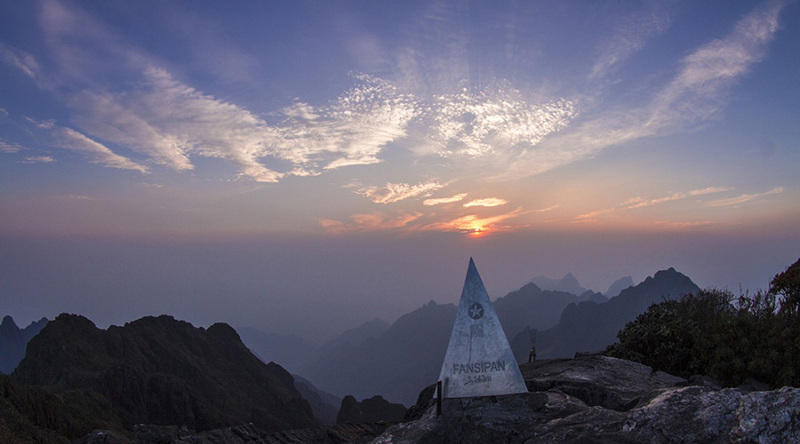 From there you can see Fansipan, the highest peak of Indochina mountains as well as enjoy stunning views. The trek will be relatively soft until lunchtime. After a couple of hours of hiking, you will have a break at a nice spot in the forest and enjoy a good lunch. After having breakfast, you climb to the top, where you can celebrate your victory. From there, you can enjoy the best view to beautiful sceneries. You will then trek through rainforest to go back to the campsite for lunch. After lunch, you start your journey back. You follow the trail as well as stone steeps built by Hoang Lien National Park until you meet your car, which is there to take you back to Sapa. In the afternoon you will arrive back in Sapa, where you can celebrate your achievement and relax. Evening transfer to the station for a night train to Hanoi. Overnight on train. – Transport by private Jeep or van as tour program. – Airport taxes; Visas; dinners; travel insurance; tips; – Personal expenses, emergency transfers.